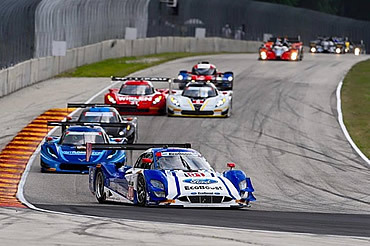 ELKART LAKE, WI (August 10, 2015) – Chip Ganassi Racing with Felix Sabates (CGRFS) with drivers Scott Pruett and Joey Hand finished third in the Prototype class in the Continental Tire Road Race Showcase at Road America. Hand qualified the No. 01 Ford EcoBoost Riley on the pole, earning his first pole with CGRFS and Ford’s first pole of the 2015 season. Hand gained a five-second lead on the field shortly into the 2 hour, 40 minute race. The first full-course caution flew for a car in the wall in Turn 11 of the 4-mile road course. Hand brought the No. 01 in under yellow for tires and fuel, and the crew took a few extra seconds to determine why the car was beginning to slow on course. Hand restarted at the back of the field but raced cleanly and steadily in an effort to catch the rest of the Prototype field. Hand passed 15 cars and was running a second faster than the leaders by time he caught up with the rest of the Prototype field. Hand brought the No. 01 in for a driver change and Pruett got behind the wheel with 40 laps to go. Shortly after taking control of the No. 01, Pruett turned the quickest lap of the race with a time of 1:57.464. Pruett pitted from the fourth position for his final stop of the race for four tires and fuel. After pit stops cycled through, Pruett raced his way into the third position and would hold off competitors to earn the third podium of the year for the No. 01 team. The next TUDOR United SportsCar Championship race for CGRFS will be the Lone Star Le mans at Circuit of The Americas in Austin, TX on September 19.  After easily defending his lead from the pole position for nine laps, Hand noticed an issue and had to pit. The team identified the problem as a loose hose clamp on the turbo.